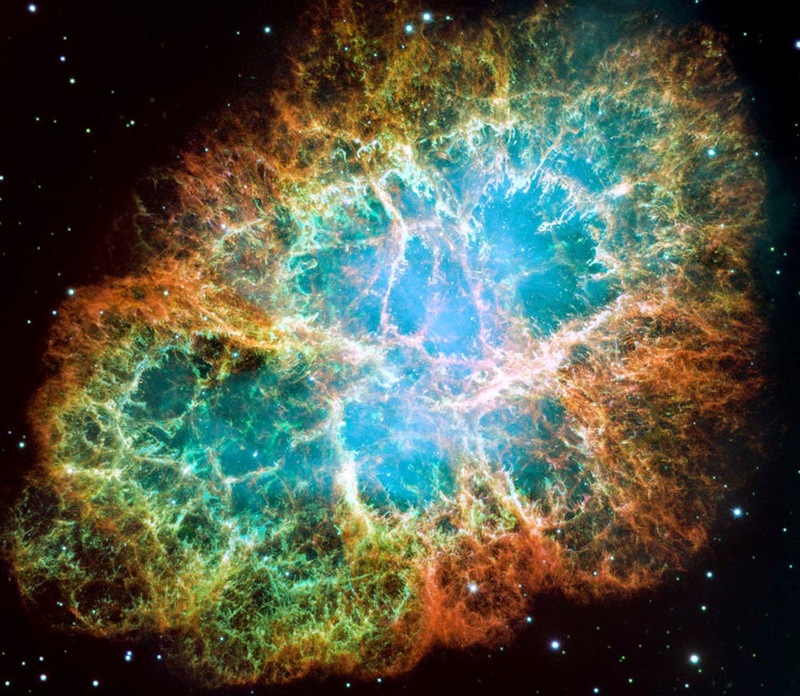 Another look at the Crab Nebula. This much more detailed image was taken by the Hubble. This nebula has the distinction of being M1, meaning it is the first object in the catalog compiled by French astronomer Charles Messier in the 18th century. Although the 110 objects identified in the catalog are still referred to by their Messier numbers, they were catalogued not because of what they were, but rather what they weren't: comets. Comets were Messier's passion, and he originally thought this nebula was actually Halley's comet, which was due for its periodic visitation. After noticing that the "comet" didn't seem to be going anywhere, he realized that a catalog of all the vague cloudy objects in the sky that could be mistaken for comets would be useful for comet hunters like himself so they wouldn't waste time observing them. The catalog contains nebulae like this, but also galaxies and star clusters -- the Andromeda galaxy, the nearest spiral galaxy to our own, which is frequently bright enough to be seen with the naked eye, is commonly referred to as M31. Messier did manage to find comets, by the way: thirteen of them.